The Dow Jones Industrial Average today (Monday) gained more than 125 points on the back of a surge in oil stocks and investors shrugging off concerns about the U.S. Federal Reserve's decision last week to maintain interest rates at current levels. Biotech stocks cratered this afternoon following a statement by Democratic presidential candidate Hillary Clinton indicating that she would create a plan to prevent "price gouging" for specialty drugs. 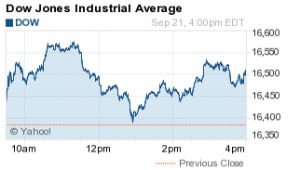 The iShares Nasdaq Biotechnology ETF (Nasdaq: IBB) fell 4.5% on the day. Shares of Amgen Inc. (Nasdaq: AMGN), AstraZeneca Plc. (NYSE ADR: AZN), and Celgene Corp. (Nasdaq: CELG) all slipped more than 2.3% on the day. The biggest loser was Juno Therapeutics Inc. (Nasdaq: JUNO), which fell almost 11% on the day. The S&P 500 Volatility Index (VIX), the market's fear gauge, slipped 6.9% on the day. Stock Market News: Nine of the 10 major S&P sectors gained on the day, despite a slump in biotech stocks. Markets had moved higher in the early morning after St. Louis Federal Reserve President James Bullard announced he would have opposed the central bank's rate decision if he were a voting member. Meanwhile, the biotech slump came after Hilary Clinton posted on Twitter Inc. (NYSE: TWTR) she will announce a price-control plan tomorrow. The statement comes in the wake of a New York Post article that highlights how a pharmaceutical company raised the price of a 62-year-old drug astronomically and the impact on a patient. Oil Prices Rise: Oil prices surged today on news that U.S. energy production is declining. WTI prices added more than 3.9% to hit $46.45, while Brent oil prices added 2.9% to hit $48.84. According to Baker Hughes Inc. (NYSE: BHI), American producers have mothballed and slashed rigs from production for three consecutive weeks. Money Morning Global Energy Strategist Dr. Kent Moors says that supply and demand will work in tandem to lift oil prices over the long term. Many oil watchdog groups like the International Energy Agency (IEA) are expected to raise their 2015 demand figures soon. Here's a breakdown of the oil market's fundamentals. Housing in Flux: The National Association of Realtors announced that U.S. home sales slipped by nearly 5% in August to an annual rate of 5.31 million units. The figures were far lower than economists anticipated and raised concerns about a market that many believed was showing stronger growth. On Tap Tuesday: Tomorrow, a light U.S. economic calendar includes the Richmond Fed Manufacturing Index, the FHFA House Price Index, and a speech from Atlanta Federal Reserve President Dennis Lockhart. The markets are most likely to react to China's Caixin Manufacturing PMI Flash report for the month of September. In August, the nation's PMI data showed its manufacturing industry fell at its fastest rate in more than six years. Companies reporting earnings on Tuesday include Carnival Corp. (NYSE: CCL), AutoZone Inc. (NYSE: AZO), Darden Restaurants Inc. (NYSE: DRI), General Mills Inc. (NYSE: GIS), ConAgra Foods Inc. (NYSE: CAG), and CarMax Inc. (NYSE: KMX). Stocks to Watch 1, VLKAY: Shares of German automotive giant Volkswagen AG (OTCMKTS ADR: VLKAY) fell more than 17% in overseas trading today after the firm admitted it rigged emissions tests in the United States for roughly 500,000 diesel cars. The company's CEO apologized in a statement and ordered an investigation into the company's practices. Meanwhile, the firm has stopped sales of all diesel vehicles. Here's why Volkswagen could see more pain in the future. Stocks to Watch No. 2, AAPL: Shares of Apple stock (Nasdaq: AAPL) were up 1.6% on news the company is moving faster to launch Apple Pay in China. This is a critical development for a company aiming to boost its profits in the world's second-largest economy. Here's a breakdown of what Apple Pay means as it expands its presence in Asia, and how you can profit. Stocks to Watch No. 3, NFLX: Shares of Netflix Inc. (Nasdaq: NFLX) were down more than 2.2% on concerns about growing competition in the content-streaming space. NFLX stock is now down more than 11% since Aug. 1. But while some investors are looking at this pullback as a buying opportunity, Money Morning breaks down a number of different other indicators that make NFLX stock expensive. In fact, it's overvalued. Here's what you need to know. Stocks to Watch No. 4, P: Shares of Pandora Media Inc. (NYSE: P) gained more than 5.5% today on news the U.S. Copyright Office approved its pact with Merlin Network, a digital rights agency for independent musicians. The partnership ensures the proper payment of royalties to these musicians.